In order to score the ball must be played into the end zone from a wide neutral player. Players must time their runs into the end zone so they arrive after the ball has traveled into the end zone. Players can not be waiting in the end zone for a pass. Vary the size of the end zone to make the final pass and timing of run more difficult or easier. If the end zone is 15 yards deep – scoring will be easier compared to if it was 5 yards deep. The idea of the exercise is to get the ball wide and look to make penetrating runs in and behind the opponents. There are many variations you can try. 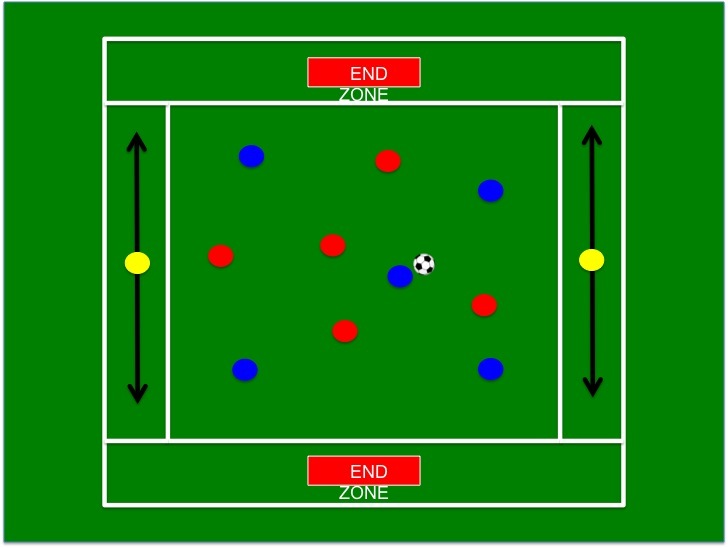 Increase the pace of the game by playing 2-touch, add 1 or 2 neutral players in the middle to increase ball circulation, add 3-5 neutrals in the middle and play 1-touch only, make channel neutral players 1-touch etc.